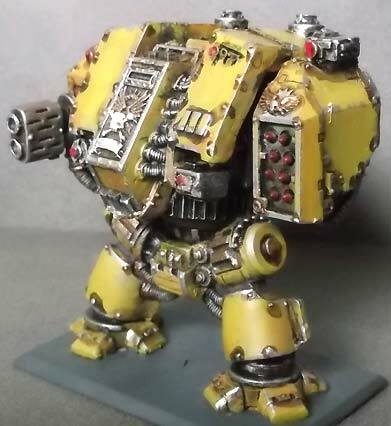 The challenge of painting Imperial Fists is, of course, how to make yellow look cool. I used lots of black, used medium blue for trim color (instead of red), and use a brown wash to dirty up the yellow. This scout sergeant is a converted Space Wolf sergeant- I added an auxiliary grenade launcher onto the bolter. I love the grenade throwing pose of this model. This is one of the old metal scouts- similar in style to the old plastics, but just a little nicer (plus you get some variety in the pose). I prefer the old style scouts to the new ones only because they look younger, like raw recruits (okay, the real reason is that I already had tons of them painted by the time the new scouts came out, and I'm too lazy to upgrade). My impression of the Imperial Fists is "lots of heavy weapons" (Milton Bradley's Space Crusade has something to do with that, btw)- so instead of a stock bolter, I upgraded this Captain model with a heavy stubber. I spliced a chaos marine bolter belt feed and front end onto the original bolter, and added a large muzzle brake from an ork shoota. 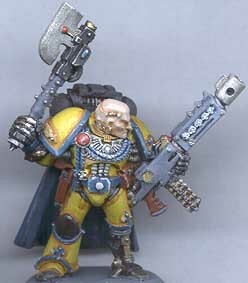 The Power axe is also a minor conversion. This model had lots of trim detail to paint, and shows off the color scheme nicely. No real converting here, I was just really happy with the way this devastator came out. 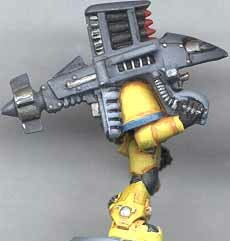 The barrel of the Heavy Plasma Gun was painted gold, which stands out nicely against the dark grey of the gun itself. 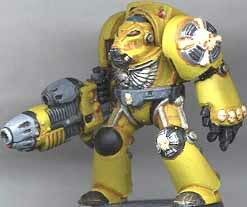 The feet, hands, and kneepads are painted black, forming a nice contrast with the yellow armor. 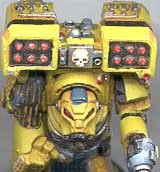 Since the Imperial Fists shoulder pads were not available at the time, I used any decals I could find. This "fist and crossbones) is from the Epic Imperial forces decal set. My shoulder mounted Multimelta, made out of a Space Crusade Dreadnought weapon. I ground out a slot for the shoulder pad, and added a grip from the Las Cannon weapon. For it's time, I felt it was a pretty nifty conversion- of course, now there is an actual Multimelta available (in the "low slung" style). This model's legs show off the brown wash nicely. I still love the old "Mk. 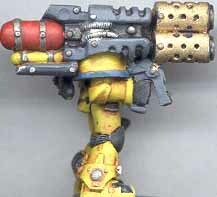 6" style plastic missile launcher, and did not hesitate to use one with the Mk. 7 devastator models. The only trick is painting up the arm so that it looks more like the modern Mk. 7 arms, rather than the old Mk. 6 arm. Now there's a devastator-sized weapon! 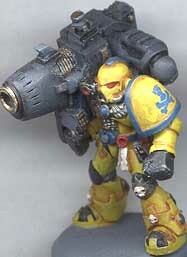 Keeping with the heavy weapon theme, I equipped the Imperial Fists terminators all with heavy weapons (flamer, assault cannon, etc), including this... heavy plasma cannon? Yep- I spliced a plasma gun and plasma pistol front end onto a heavy flamer back end for an all-plastic terminator conversion. 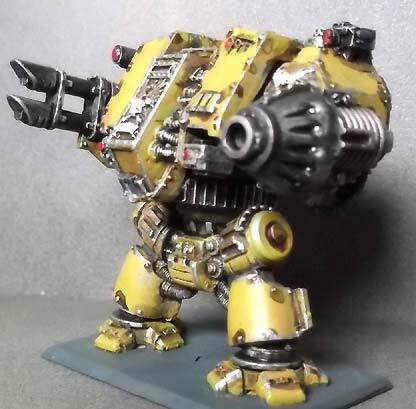 I figure, if the Ultramarines (of 2nd Edition) can take an artifact along these lines, surely the Imperial Fists could too... 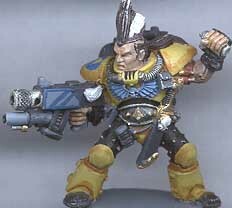 Besides, I wanted lots of variety in the terminator weapons, rather than just kitting everyone with assault cannons. Plasma weapon, and parts from the Imex power plant kit. I also finally made use of some rare earth magnets I bought a while back.